Films tend to take us into another world where one can escape into the fantastical. Obviously not all films fall into this realm but in the end we all go for the same result, to escape. There are films though that are able to capture such a natural, genuine tone that the lines of reality and film begin to blur together. Romance comedies in my opinion are not the best examples of this because they tend to go more over the top to deliver that “all too sweet” happy ending. In the case of first time feature director Sophie Brooks and her film The Boy Downstairs that is not the case. Starring Zosia Mamet (Girls) as Diana and Matthew Shear (The Alienist) as Ben, we experience their entire relationship from beginning to end as well as their reconnection. The film also incorporates a strong supporting cast of Deirdre O’Connell and Diana Irvine who each play seamlessly alongside Zosia which make the film flow so effortlessly. The chemistry between Zosia and Matthew is also apparent through its uncomfortable first moments, lingering silent periods and just plain awkward every day occurrences. The comical moments in the film are not zany/childish they play as natural beats from annoying conversations with customers to just having extremely bad timing. What caught my attention were the same details Brooks added throughout the flashbacks of their relationship. I never felt the film was one sided to either character especially since it mainly follows Diana. We were presented both sides of this relationship and when all put together gives the viewer the entire picture instead of just one quick moment. You are able to feel both Diana and Ben’s pain along with their reluctance and eventual acceptance. It shows the strength of both Zosia and Matthew’s acting as I do not believe this dynamic could be easily replicated. 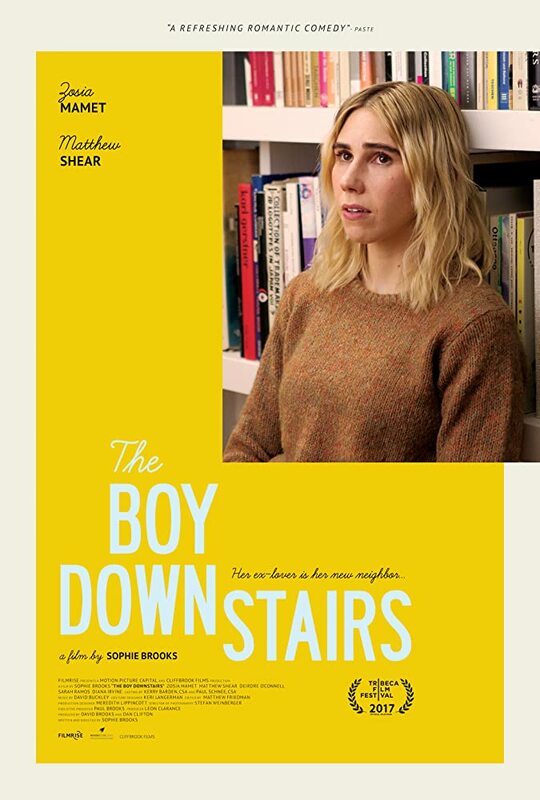 Brooks delivers a solid film in her first outing as The Boy Downstairs never felt like your typical “rom-com”. I enjoyed it not only as a simplistic take on how a real relationship in New York City feels but also because of the talents involved. The cast delivers strong performances throughout and each bring their own to their characters giving the viewer something to relate to rather than watching someone “go through the motions”. Much like the theme throughout the film, grasping opportunities/seizing a moment, what do you have to lose?